Vic Brown in his kingdom. 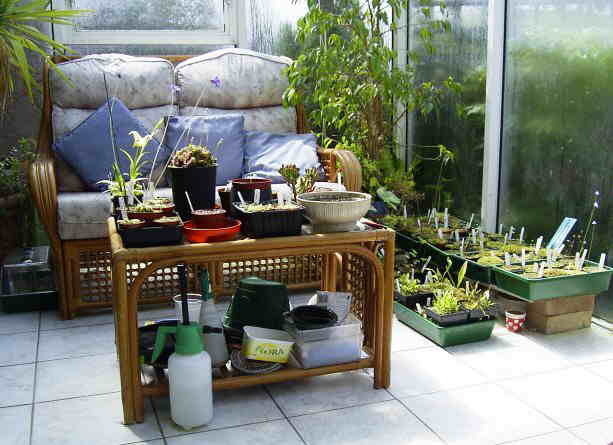 As requested, here are some pictures of my Conservatory, an exercise in getting as much CP diversity as I can into a fairly small space, yet enabling it to be just about used as a living area too! Here is a view from the outside, the small cold frame is used to house my small, but rapidly growing collection of temperate Pinguicula and to over winter some plants, such as VFTs and to summer others, such as pygmy sundews. 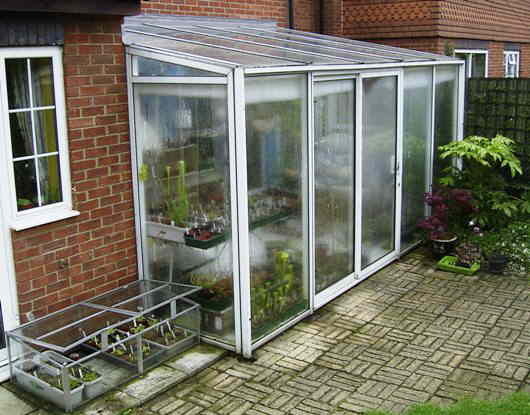 The Conservatory has a floor space of 4.6 x 2.8 m (15 x 9.2 feet). 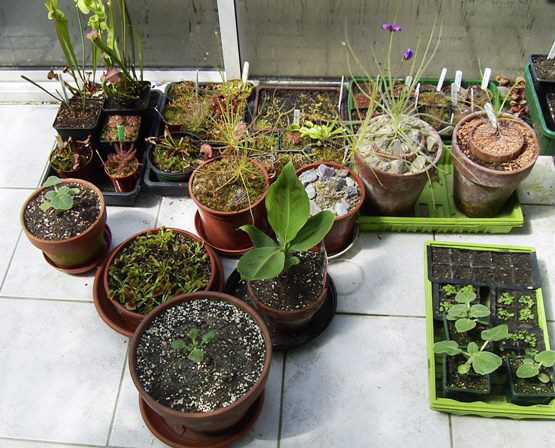 The sunny corner, as it looks today (sun went in just before I took this one though!) 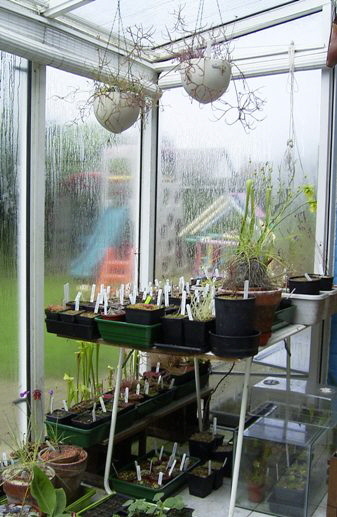 I have to wait until my kids (10 and 7) grow up a bit and no longer use the climbing frame, just about visible in the background through the steamed-up glass, before I can erect a glasshouse in that part of the garden (its the sunniest bit!)! 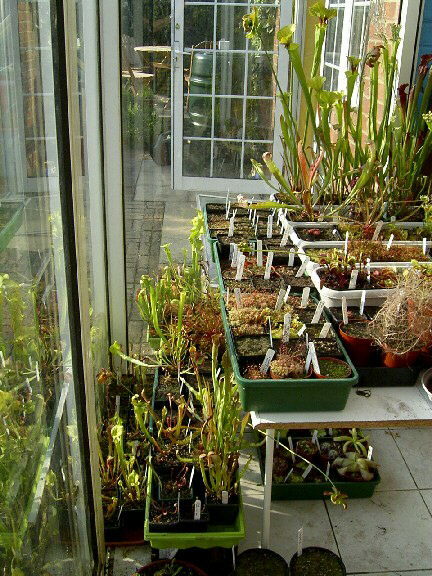 The glass does clear by early afternoon when I open up the windows and doors to allow it to stay cool, but hey steamy windows are price worth paying if you want to grow Nepenthes. There is some furniture, you can just about find room to balance a mug on the coffee table! I have two matching armchairs for the sofa, but they went into storage last year. I give the sofa another year at least ! 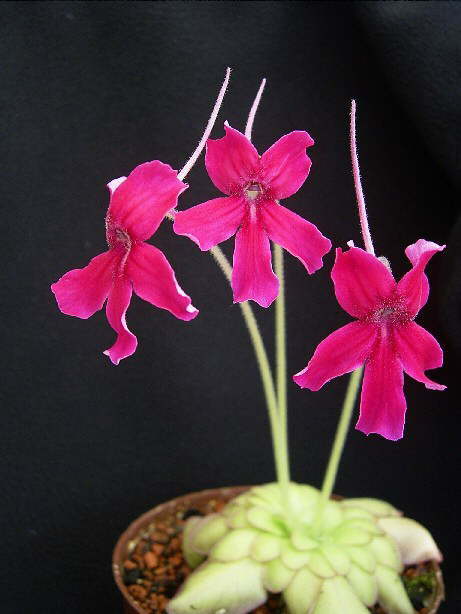 The main Utricularia, Genlisea and wet-loving SE USA Pinguicula area. 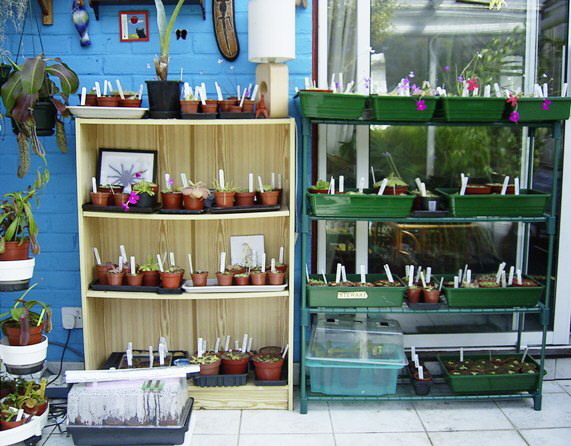 I'm particularly fond of this plant stand, which I picked up at a local junk shop for £3. 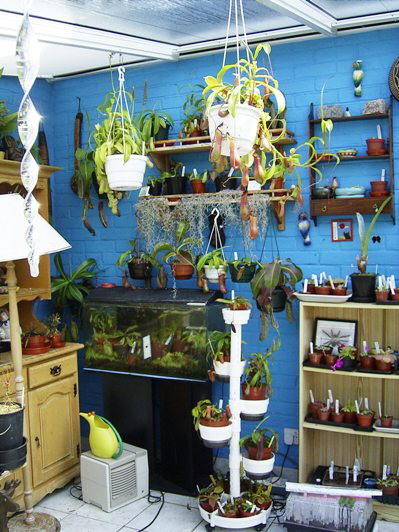 It's great for Nepenthes, its on wheel, and the pots can drain freely, with the excess water collected in an easy to remove and clean drip tray below. I'd like some more, but think it probably dates from the 70s or 80's, so I'll have to keep my eyes open in junk shops! A typical bit of floor! 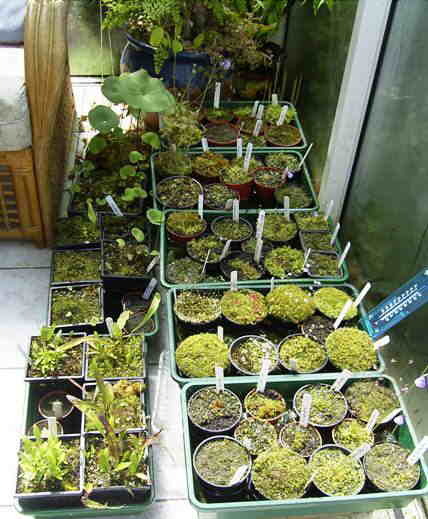 Here are some of the Pinguicula, Vic is growing. 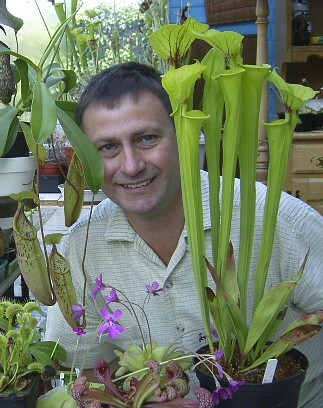 Many others can be found in this website. 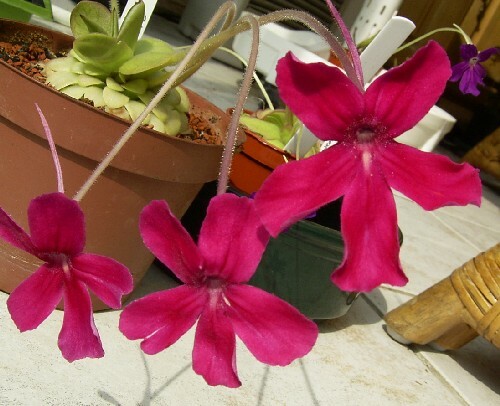 P. laueana 'CP2’ , clone with a rich crimson purple with elegant arching up-turned spur. 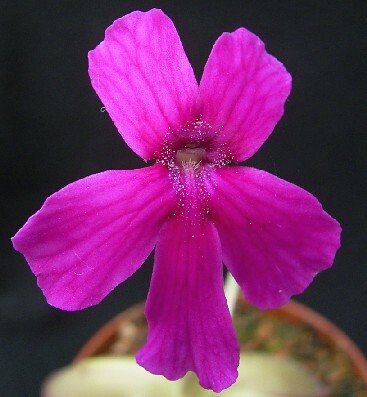 P. laueana ‘CP3’, vibrant cerise pink flowers. 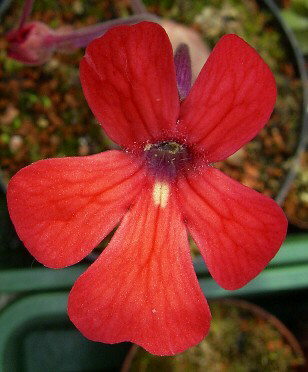 P. laueana 'Typical’ : Pillar-box red flowers with a creamy beauty spot on the throat.